Deadhead Productions is bringing the first of their three annual festivals to The Farm in Eureka Springs, Arkansas, in just THIRTY days. 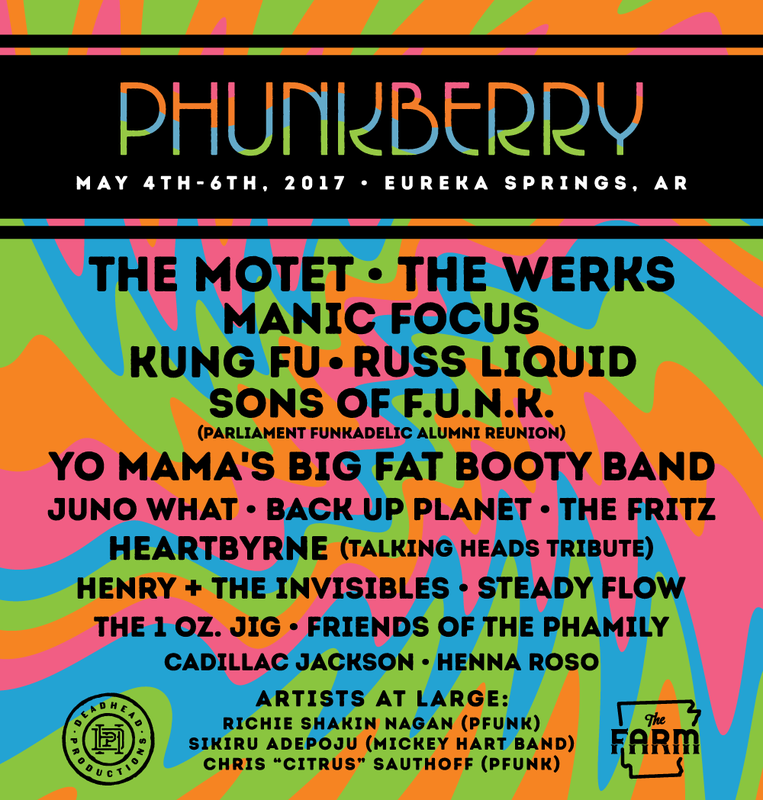 To kick off D.H.P.’s festival season is Phunkberry, taking place May 4th-6th in smack dab in the middle of the breathtaking Ozark Mountains. The “Berry’s” (Phunkberry, Highberry: June 29th-July 2nd and Hillberry: October 12th-15th, 2017) are some of our favorite festivals to attend because, well, they just ARE. The music lineups are always top notch and filled with well-rounded talent of all types, there is always an abundance of yummy food and merchandise vendors, live art and creativity abound the loving grounds and the rolling Ozarks are filled with gleeming smiles and an overwhelming sense of joy, gratitude, community and love. Phunkberry features the cream of the crop when it comes to the best in funk, future funk and just damn good music today. Just take a look for yourself and imagine you and your closest Phamily spending a relaxing weekend camping away under the stars in the perfect end of Spring weather. The river is just a short drive down the way and you can even stay after the festival is over to camp your way into the Summer. Take a peek into the world of Phunk with this sweet little teaser video by Andrew Dolan and snag your more than affordable tickets here.